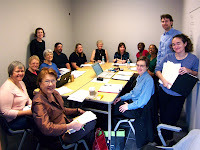 A picture of our workshop class. A picture not taken would have shown the cool independent bookstore, Voltaire’s Books, that our class-room was attached to. Several 4-day workshops took place between the two sessions of seminar, covering various genres and topics. Ours was Non-Fiction for Fiction Writers, and was taught by the guy standing on the right-Trevor Corson. 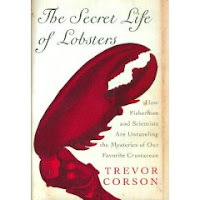 He’s written, among other things, two books, The Secret Life of Lobsters, and The Zen of Fish. I can recommend both, although I have an affinity for the second, much of which takes place in Los Angeles–at locations I know; talks about the history and process of making sushi–already interesting to me; and follows a class of aspiring sushi-chefs at Hama Hermosa–something I can imagine myself or many people I know deciding to do.